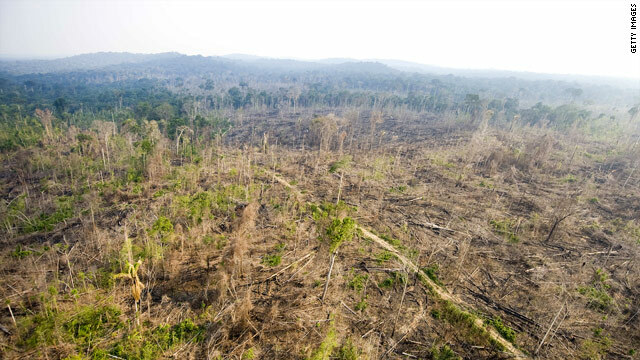 Deforestation is a major issue for developing nations in the fight against climate change. (CNN) -- Bhola Prasad Bhattarai traveled from his native Nepal to Denmark to see how the "big people see the little people." At the Copenhagen climate summit, Bhattarai, 33, head of an umbrella organization of 15,000 community forest user groups, has withstood a Scandanavian winter's chill, police charges, an arrest, pricey lunches -- and disappointment that ultimately, the global meeting could end up achieving little. Still, he harbors hope. He has to. Sustainable forest management is personal to him -- he's from a village that depends on trees. So when negotiators at the climate summit neared an agreement Wednesday on compensating poor nations for forest protection and other natural environments that help curb carbon emissions, Bhattarai was encouraged. The United States, Australia, France, Japan, Norway and the United Kingdom have pledged $3.5 billion for the program known as Reducing Emissions from Deforestation and Forest Degradation (REDD). Scientists vary on the data, but between 10 and 20 percent of the world's carbon dioxide emissions results from cutting down trees that would otherwise absorb them. REDD attempts to make it economically feasible for poor people to participate in conservation. "As part of an ambitious and comprehensive deal, we recognize the significant role of international public finance in supporting developing countries' efforts to slow, halt and eventually reverse deforestation," said a joint statement from the donor nations. Some environmental groups hailed the initial funding. "There can be no solution to climate change without addressing deforestation," said a statement from Global Canopy, an alliance to conserve forests. "Deforestation must be addressed now, not later, if we are to meet an 80 percent, [carbon dioxide] reduction target by 2050." With a final draft expected by the end of the week, REDD, a previously obscure acronym has been thrust into the spotlight as a victory at a climate summit that many fear will close without significant results. But to poor people like Bhattarai, REDD isn't an exclusive path to going green. While REDD would go a long way to saving Nepal's forests, Bhattarai said that without a commitment to cut emissions from world powers, forest conversation would mean little. Advocates for the poor agree. Raja Jarrah, climate adviser for the humanitarian agency CARE International, which works with Bhattarai's group in Nepal, described REDD as a shiny part of an otherwise beat-up car. He said REDD could provide key resources to people who live around forests, giving them the ability to retain their livelihoods. But no amount of REDD, he said, can compensate for a failure to reduce emissions. "Without that, REDD is irrelevant," Jarrah said. "It's certainly putting an unbalanced burden on the world's poorest countries. It's unfair." Unfair, said Bhattarai, because in his remote village, people will do their part for sustainability. It is after all insurance for their children. Bhattarai pondered a time when the slopes of the Himalayan kingdom were stripped gray after years of government control and severe deforestation programs. Profits from timber imports to countries like India fattened the wallets of the wealthy and threatened the livelihoods of the poor, said Bhattarai. Almost 30 percent of Nepal's forest land had been denuded by the early 1990s, he said. But Nepal is better off than many developing nations. Bhattarai said the landscape is turning verdant once again thanks to the government returning control of forest land back to communities. A grassroots movement to protect forests has since blossomed. Bhattarai's organization, the Federation of Community Forestry Users (FECOFUN), advocates that local control of forests is the best way to ensure sustainability. The group estimates that 2.5 million acres of land once owned by the government is now flourishing in the hands of ordinary people. In his village, 65 of 158 households are reliant on forest land, lush with firewood and fruits, lemon grass and aromatics, which are sold for herbal medicinal value. "The government can never have the kind of access that we have on the grassroots level," he said. "Local people are thinking about the next generation. If we link people and forests, that will be a sustainable forest." So, for his four-year-old daughter's sake, Bhattarai traveled to Denmark. He has already marched on the streets twice and was arrested and briefly detained last Saturday, he said. "We are keen to see what will happen here," he said. One thing Bhattarai realized in Copenhagen was the gap that still exists between industrialized powers and developing nations, including his homeland. He wanted to see how the rich treat the poor in terms of climate regulations. He said the first place he found an answer was in a $12 -- expensive by Nepalese standards -- meal of chicken and potatoes.